Despite the fact that Goole is a port, the town only received two raids from the air during the course of the two world wars. Beatrice Alice Harrison (6 y) and her sister, Florrie (4 y). Their father, George Harrison, a Marine Fireman, died two days later. Mum did not wish to spoil your outing, and so did not mention anything to you to cause anxiety. We did not expect anything would be allowed in the papers so soon, by the censor. Enjoy your holiday, while you have the opportunity. Well, now! The zeps came at 11.15 pm Monday. Hook bridge got the first. They tried hard for bridge, dropping 3 bombs, but all missed - they are all at the bottom of the ouse. Many dropped between bridge and Goole, but striking soft soil, never exploded - three were dug out of the barley field at Kingsway end, they passed our house to the police station: some took 2 men to lift them. One fell on Jessie's back, onto the Kelsey's garden; that didn't explode, luckily; the next struck a house in Axholme street, passing thro' roof and I can tell you the deep booming roar woke me, and our room was one red glare - all Shuffelton seemed to be ablaze. ma thought it was thunder, and lightning. 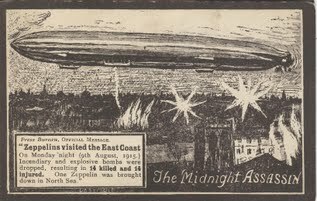 I kept quite cool and resigned - it was an incendiary bomb, but the fire was put out. The next fell thro roof of Mrs Acast, the stone house, next to our butcher's - four were sat at supper and three were killed; Mrs + 2 daughters, a visitor escaping. Another fell just opposite this one, the other side of Victoria street, next to Clarkson's shop and next to where Mrs Ellis went to live; it crashed thro roof and was an incendiary, but fire was put out. I have had a piece of it in my hand. Walker, Hook Rd., was repairing roof yesterday. Then came some demons. One fell in George Street (Back) - 3 houses had wall blown out into the lane, and beds, bairns, bolsters and pictures after them. 4 killed. Roof crashed down on Tuesday morning. Pa, Ma, 2 children - Mr Gunnee carried girl out, all flesh of one leg torn away - next he fetched a young baby, but the sight finished him; he was done ... sick ... he went away ... to vomit. Had it been a man, he says he would not care. Next fell in Ouse (Back) near T.K. Willson's baker. Hole in wall, drive horse and car thro' - floors are all down in the cellar, furniture just a pile of ruin, pictures hang akimbo. Next a beast came, for destruction to property, tho not to life, fortunately. It struck the Quay wall, just opposite Adam Street end. Stone blocks 2 feet thick, were splintered, and the solid masonry under them. Docks haydraulic pipes broken, log wood sent flying, railway wagons derailed and smashed to pieces - Lowther hotel hasn't a window left, all blown out - woodwork included and so is all Aire Street, Hoppers, Makintosh, Murdock, right to Armitages and Timm's. Our office end windows broken and so are Brook's Bank. All are now white boards, nailed up. Next fell on our Hamburg shed; it smoldered some hours and then burst into flame at 6.00am. Most is destroyed, shed and contents. Another fell near, into a wooden shed and blew it to pieces, scattering goods, slates and planks in all directions. Next fell on the coal sidings, just off Bridge Street. Could you have seen result, you would know what a crater is; it made one. A loaded coal truck, 14 tons, was shoved off the line, both rails broken thro and bent inward, aye and split lengthwise. I saw them. An N.E.R. truck knocked into fragments and one of our butter vans smashed. Steel springs and thick iron grease boxes (Where the axle turns in) broken like match wood. More fell near Alum works, where similar craters were made and minor damage done. We shall never know how many were dropped, some are at the bottom of the dock, I have talked to a man who was in a small boat, at the time, near a coal hoist; he did not know where to turn for safety, they seemed eveywhere, one passed close to him, into the water. But you should have seen the fugitives fleeing. Mount Pleasant was swarming; swarming. The Harrison girls slept on the bare ground, there. See a barefoot woman, only nightdress on, a baby in her arms and two children pulling at her. Midnight - yes! 20th century culture and all up the knees in wet and field soil. We had had down pour all morning. Airmyn and Rawcliffe roads were alive, all night. All flocked out, too, on Tuesday, at dusk, but better prepared. Men and women, bairns and baskets, chairs and stools; aye and even beds were taken out to field and hedge side, road and lane, seeking safety = 14 were killed but 2 more children, girls, died in the hospital, y'day. Inquest is on, this morning: funeral tomorrow. There are some 36 unexploded bombs at Police station, I am told = and are to be on view this afternoon. A full report of the raid may be found in The Goole Times, 20th December 1918. Ironically, there were more Goole casualties as a result of military aircraft crashes than were caused by raids during the whole of WWI and WWII.